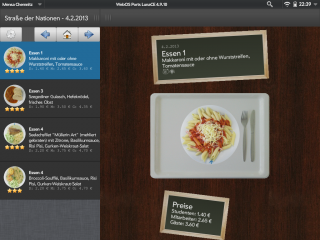 This app displays the TU Chemnitz or FH Zwickau canteen menu of a day. You can switch about different days with arrow buttons and zoom with a double touch of the food image. 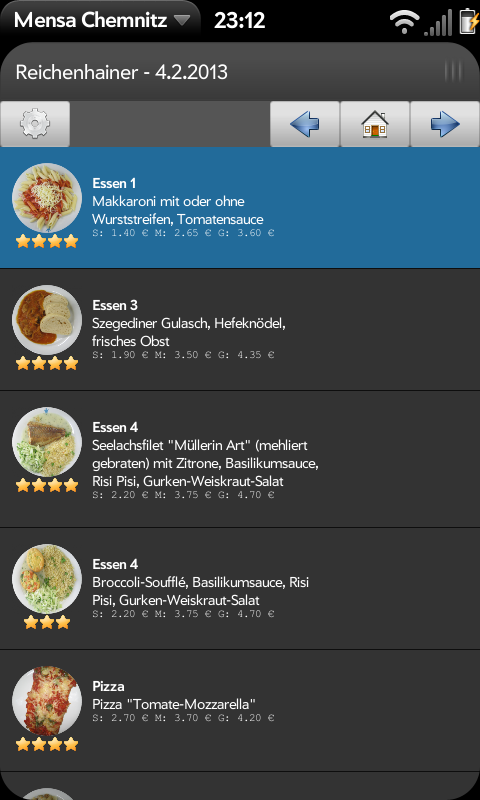 Currently you can choose the mensa in the Strasse der Nationen (StraNa), Reichenhainer Strasse (RH), or Mensa am Scheffelberg (FH Zwickau). This app is available and tested for HP Touchpad, HP Pre3 and HP Veer. This app is licensed under the AGPL 3.0 (http://www.gnu.org/licenses/agpl-3.0.html).